There are times like these, when I read something so ridiculous, that I am truly proud to be Canadian. There is actually a class action lawsuit that has been filed, against Apple, because somebody doesn’t think Siri performs exactly as it does in the commercials. WSJ is reporting today that a fellow by the name of Frank M. Fazio is part of a class action lawsuit, which states that Apple’s integrated assistant does not not work as good as it should in real life. 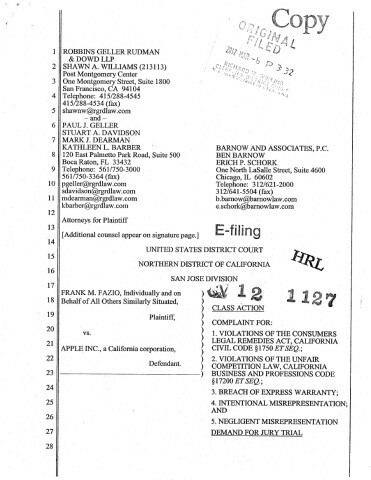 The lawsuit says that Frank was unable to get proper directions from Siri, and at times, Siri did not understand him. All I can say is, wow. How many times, in real life, have you used a product or ate some food that didn’t look or perform exactly as it did in the commercial? This happens all the time. When it comes to the iPhone 4S and Siri, we Canadians haven’t had a working version yet, but for basic tasks that aren’t location based, it has worked just fine for me. The class action suit states that Siri is “a work in progress, at best”. Yes! Yes, it is. Apple said that, when Siri was introduced. They have yet to say it is out of beta, and probably won’t until it’s available and working in all the countries that the iPhone is offered. You can read the entire class action lawsuit here. What is your opinion on this? Comment below.